Since the mid-nineteenth century, Western scientific thought has stated that all present-day species on Earth, including man, have arisen from earlier, simpler forms of life. This theory means that the story of human evolution begins with a creature most people today would not consider human. In 1859, the view of man's history and his place on Earth was changed forever by the publication of On the Origin of Species by Means of Natural Selection, written by English naturalist Charles Darwin (1809–1882). In this revolutionary book, Darwin stated that all living things achieved their present form through a long period of natural changes. In his 1871 book, The Descent of Man, Darwin further argued that man descended from subhuman forms of life. The history of how the human species evolved has been reconstructed by evidence gathered by paleontologists (who study fossils), anthropologists (who study humans and their origins, development, and customs), anatomists (who study the structure of biological organisms), biochemists (who study chemical compounds and processes occurring in biological organisms), and many other scientists. Most of the concrete evidence comes from the record left by fossils, which are remains or imprints of ancient plants or animals that are found in layers of rock. In practice, human fossils are mostly bones and teeth, which are the parts of the human body more likely to be preserved over a great time period. In the overall history of life on Earth, the human species is a very recent product of evolution. There are no humanlike fossils older than 4.4 million years, which makes them only one-thousandth the age of life on Earth. The human species, or Homo sapiens, belongs to the hominid family tree. Hominid means "human types," and describes early creatures who split off from the apes and took to walking upright or on their hind legs. Studies have shown that Homo sapiens share a clear anatomical and genetic relationship to other primates (members of the group of mammals that includes lemurs, monkeys, apes, and humans). Of all the primates, humans have the closest relationship with apes. Both species have descended from a common ancestor. At some point in evolution, the branch of primates split into two arms. One evolved into modern apes, while the other evolved into modern humans. 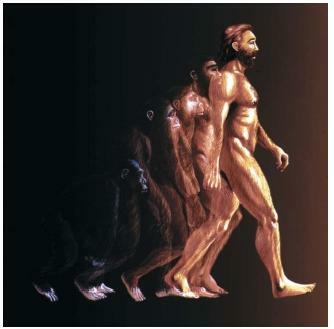 The reasons that human ancestors started to walk upright are not known. Possibly, it was a response to environmental changes; as tropical forests were beginning to shrink, walking might have been a better way to cross the grasslands to get to nearby patches of forest for food. Standing upright also may have been a means of defense that slowly evolved. When chimpanzees or gorillas become excited, they stand in an upright posture and shake a stick or throw an object. By standing upright, they appear bigger and more impressive in size than they normally are. In addition, the ability to stand up and get a wider view of the surroundings gives an animal an advantage in the tall grasses. Walking upright also frees up the hands to carry objects, such as tools. Fossils: Remains or imprints of ancient plants or animals that are found in layers of rock. Hominid: Member of the family of primates that includes modern humans. Primate: Member of the group of mammals that includes lemurs, monkeys, apes, and humans. Australopithecus . One of the oldest known humanlike animals to have walked upright is believed to be Australopithecus afarensis, meaning the southern ape of the Afar region in Ethiopia, Africa, where the fossils were found. The most famous of these fossils, nicknamed Lucy, was found in 1974 near Hadar, Ethiopia, by a team of anthropologists led by American Donald Johanson (1943– ). Lucy lived about 3.18 million years ago, and had a skull, knees, and a pelvis more similar to humans than to apes. Her brain size was about one-third that of modern humans, yet larger than any apelike ancestor to have come before. She would have stood about 3.5 feet (1 meter) tall, with long arms, a V-shaped jaw, and a large projecting face. In 1924, Australian anthropologist Raymond Dart (1893–1988) discovered fossils at a site called Taung in South Africa. These fossils, dated at 3 million years old, were named Australopithecus africanus, meaning the southern ape of Africa. Australopithecus africanus probably evolved from Australopithecus afarensis, but was slightly taller and had a slightly larger brain. Altogether, there were probably four main species of australopithecines. Kenyanthropus . In early 2001, discoverers and scientists of human evolution were stunned by the announcement of the discovery of a 3.5 million-year-old skull from what appeared to be an entirely new branch of the early human family tree. The skull was discovered in 1999 by a research team led by Meave Leakey on the western side of Lake Turkana in northern Kenya. Leakey named the new member of the hominid family Kenyanthropus platyops, meaning flat-faced man of Kenya. With a flattened face and small molars, this hominid differed significantly from the contemporary species to which Lucy belonged. This discovery has led paleontologists to theorize that the human family tree is not one with a straight trunk, but one shaped more like a complex bush with a tangle of branches leading in many directions. Some branches lead to other branches, while some lead to dead ends. Homo . From one of these previous branches came the oldest known hominid given the Latin name Homo, or "man." 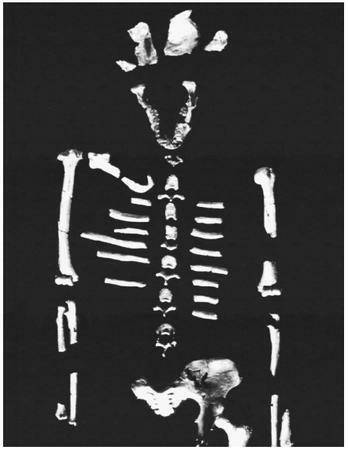 This was Homo habilis, or "handy man." Discovered by English archaeologist and anthropologist Louis S. B. Leakey (1903–1972) in 1961 in Olduvai Gorge, Tanzania, this hominid was present in east Africa at least 2 million years ago. Taller than his predecessors, Homo habilis showed the first marked expansion of the brain. He was the first hominid to use tools routinely. By about 1.6 million years ago, the hominid brain had increased to about one-half the size of what it is today, and this difference made for a new classification, Homo erectus, or "upright man." Homo erectus is generally thought to have been modern man's direct ancestor. The first known fossil of Homo erectus was found by Dutch paleontologist Eugène Dubois (1858–1940) in 1894 in Java (an island of Indonesia); it was nicknamed Java man. Homo erectus is believed to have lived between 250,000 and 1.6 million years ago, although recent scientific findings on Java indicate that Homo erectus may have lived there until about 27,000 to 53,000 years ago. Homo erectus was the first hominid to use fire and hand axes. in May 2000, a team of anthropologists reported the first undisputed proof that humans indeed left Africa at least 1.7 million years ago. The team found two well-preserved skulls about 53 miles (85 kilometers) south of Tbilisi, the capital of the Asian nation of Georgia. The skulls closely resembled those of an early human species—called Homo ergaster by some scientists and early Homo erectus by others—known to have lived in Africa between 1.9 million and 1.4 million years ago. Scientists say the find demonstrates that Homo ergaster was on the move shortly after this new species arose in Africa and that some of our earliest ancestors were already restless wanderers. Homo sapiens . Between 250,000 and 400,000 years ago, Homo erectus evolved into Homo sapiens ("wise man"). These ancestors of modern man cooked their food, wore clothing, buried their dead, and constructed shelters, but did not have a modern-sized brain. Over time, the body and brain of Homo sapiens gradually became somewhat larger. By about 40,000 years ago, Homo sapiens had evolved into modern human beings, Homo sapiens sapiens ("wise, wise man"). In 1868, the first fossils of modern Homo sapiens sapiens were found in Cro-Magnon caves in southwest France, which gave that name to all early Homo sapiens sapiens. Cro-Magnon remains have been found along with the skeletons of woolly mammoth, bison, and reindeer and with tools made from bone, antler, ivory, stone, and wood, indicating that Cro-Magnon hunted game of all sizes. Cro-Magnon buried their dead with body ornaments such as necklaces, beaded clothing, and bracelets. Cro-Magnon were artists, producing hauntingly beautiful cave art. Carefully rendered pictures of animals, human and mythical representations, and geometric shapes and symbols were created using charcoal and other pigments. Carvings of stone, ivory, and bone have also been discovered in these caves. In the late twentieth century, new fossil discoveries and genetic evidence fueled a debate concerning when and where Homo sapiens sapiens emerged. In 1988, researchers found fossil fragments in a cave in Israel that suggest that anatomically modern humans lived there 92,000 years ago. These findings support the theory that modern humans existed much longer than previously believed. They also support the theory, called the out-of-Africa model, that modern humans evolved only once, in Africa, leaving there in a rapid global expansion to replace other populations of older human forms in Europe and Asia. The out-of-Africa model is opposed by the multiregional model, which argues that modern humans arose almost simultaneously and independently in several different places in Africa, Europe, and Asia. Neanderthal man ( Homo sapiens neanderthalensis ) was the first human fossil to be found in modern times. It was discovered in 1856 in Germany's Neander Valley. These early humanlike hominids (the source of the caveman stereotype) had a large brain, a strong upper body, a bulbous nose, and a prominent brow ridge. They were proficient hunters. It is possible that Neanderthals had an elaborate culture, were aware of the medicinal properties of plants, and ritually buried their dead. Neanderthals first appeared 300,000 years ago in what is now Europe, lived throughout the ice ages, and disappeared about 35,000 years ago. survived independently of each other for thousands of years. In 1997, a team of German biologists analyzed the DNA (deoxyribonucleic acid; genetic material) extracted from the bones of a Neanderthal who lived at least 30,000 years ago. Their findings indicated that Neanderthals did not interbreed with modern humans. The findings also suggested that the Neanderthal line is four times older than the modern human line, meaning Neanderthals split off much earlier from the hominid line than did the ancestors of modern humans. Scientists do not know why Neanderthals died out, nor what the nature of their interaction with Homo sapiens sapiens might have been. We see that mankind over the period of time has been shedding their baser instincts. Man during the course of evolution has also been slowly shedding his base nature that classifies him with other animals. May be the primitive man had turned so ferocious that they were able to fight animals far bigger than themselves. Man was developing an ability that would have destroyed the environment; and in turn would have made him extinct. There appears nature’s plan to make man more and more subdued. The nature has been gradually withdrawing from man the ability to act as animal. It is in a way changing man into a sentient being. This website is the most clarified website on the web. I print the articles from here and provide them to my students.